Recent military exercises near Kaliningrad saw the introduction of the Platform-M combat robot. The sophisticated new fighting platform is to be used for gathering intelligence, discovering and eliminating stationary and mobile targets, providing firepower support and guarding important sites. For the first time, Russia’s armed forces have conducted war games with the participation of new Platform-M combat robots. In the course of the exercises by the Baltic Fleet, which took place in mid-June near Kaliningrad, the robotic combat platforms, armed with grenade launchers and Kalashnikov rifles, saw their first action, executing their military missions alongside their live colleagues. The dry runs coincided with the multinational Saber Strike 2014 and Baltops 2014 exercises being carried out by NATO in the same area. According to the exercise plan, paratroopers and coastal troops had to liquidate a group of militants with the support of a SU-34 destroyer-bomber, SU-24 naval aviation frontline bombers and MI-24 military transportation helicopters. While many are familiar with this technology, as well as with the BPM, BTR and even the BPLA tanks, the appearance of robots in the Russian armed forces is a new phenomenon. Previously this kind of Russian technology could only be seen at various exhibitions. 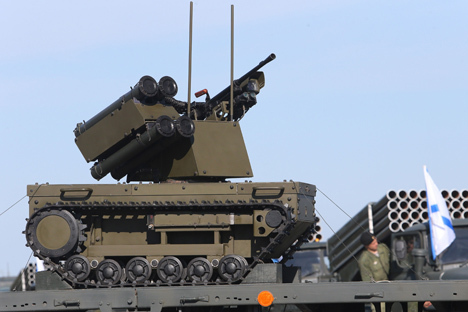 It was understood that robotic combat platforms (as the military "robots" are properly called) had been included in the armed forces when they appeared in Kaliningrad at the World War II victory parade on May 9. However, it was unclear up to the very last moment how prepared the robots were to execute their military missions. According to the press office of the Western Military District, during the Platform-M exercises "the military robots were assigned to eliminate provisional illegal armed formations in urban conditions and striking stationary and mobile targets." It was also mentioned that the Platforms carried out their tasks alongside the little Grusha BPLA reconnaissance drones. The units were also used to gather intelligence and create a passage through minefields that, according to the exercise plan, had been laid by terrorists. The Platform-M is a remote controlled robotic unit on a crawler and externally it resembles the protagonist of the 2008 Pixar computer animation WALL-E. The affinity between Platform-M and the animated character can also be seen in the robot's prototype, which appeared on the Russian internet in an animated presentation. In the video, the robotic vehicles, which resemble Platform-M (only on wheels instead of tracks), easily destroy a force of enemy militants armed with NATO weaponry. According to some data provided by the Russian military, the Platform-M unit is supplied with "a differentiated defensive chassis and a firing platform and can carry out combative tasks during the night without unmasking instruments." The robot is armed with the famous Kalashnikov rifle made in Izhevsk and four grenade launchers. At the Progress Scientific Research Technological Institute of Izhevsk, where it was made, the "crawling creation" was given the following assessment: "Platform-M is a universal combat platform. It is used for gathering intelligence, for discovering and eliminating stationary and mobile targets, for firepower support, for patrolling and for guarding important sites. The unit's weapons can be guided, it can carry out supportive tasks and it can destroy targets in automatic or semiautomatic control systems; it is supplied with optical-electronic and radio reconnaissance locators." The Platform-M did not appear out of the blue. In Russia, robotic technology has existed since the days of the Moon rovers. Back in 1964 the Russian Air Force acquired a system of long-range pilotless photo and radio technological reconnaissance called the DBP-1. This reconnaissance machine, launched from western parts of the country, could carry out its assignments over all of Central and Western Europe. In 1973 the Soviet Union initiated the first state scientific and technological program devoted to the creation and implementation of industrial robots. Consequently, by 1985 the USSR had 40 percent of the world's industrial robots at its disposal, having surpassed the U.S. These units were guided by network-centric principles and artificial intelligence was embedded in the military sphere. The anti-ship P-700 Granit unit was used in the Soviet Navy in 1983. Its peculiarity consisted in missiles that during salvos would line up in combat formation, exchange information and distribute targets among themselves. One rocket could even become a leader, occupying a higher echelon. Today the task of group interaction has a broader dimension. Russia has significant knowhow and technological capacity in this field, including expertise which is unrivaled elsewhere. However, having lost 20 years, today Russian scientists are only now catching up.